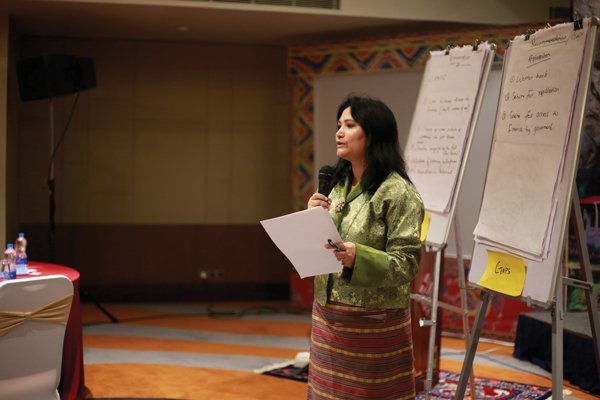 Pushpa Chhetri, Director of Bhutan Media and Communications Institute in Bhutan calls herself a social entrepreneur. She founded her company in 2011 to contribute towards a professional development of media and communications industry in Bhutan. She was awarded Loden Best Entrepreneur Award in 2016. She measures success in terms of social service and impact rather than financial benefits. Pushpa believes that women can play a significant role in social entrepreneurship development in the country, and that it is important to learn from other countries but adopt the best practices. 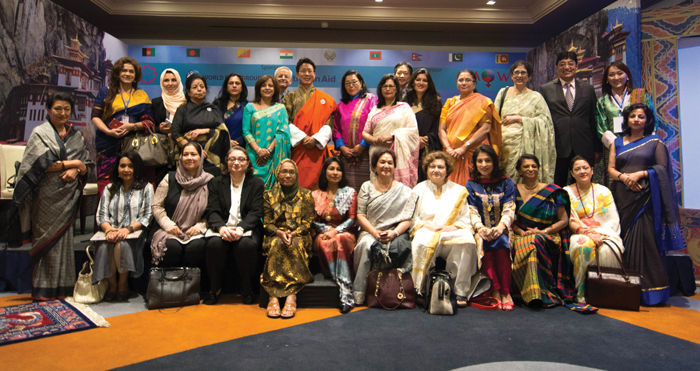 “Thus women conferences like the one organized by BAOWE and SAWDF can provide opportunities for Bhutanese women to network, learn and exchange ideas, issues with other business women from the SAARC countries. Rama Devi is the President of ALEAP (Association of Lady Entrepreneurs of Andhra Pradesh) and runs Shivani Engineers, a bus manufacturing company for the Road Transport Corporation. With the success of her entrepreneurial venture, Devi began to realize the importance of supporting and empowering women to establish their own businesses. “I realised from my own experience that women make good entrepreneurs,” she attests. ALEAP is one of many organizations working to push women towards equal footing with their male counterparts in a competitive, global market. Devi points out that this inequality begins at a rudimentary level. “The land to establish an industry is exorbitantly priced and power is costly. Small entrepreneurs are not able to sustain the rate of interest on loans given by banks. State governments must encourage small scale industries as they provide revenue to the government,” she insists. The state of women entrepreneurs in India proves hopeful, however. The current state of the number of startups and women entering the business realm is rapidly increasing, and this is seen as the golden era for women entrepreneurs as there are a variety of opportunities and platforms created by the government for women to take advantage of. Initiatives such as the Prime Minister’s Employment Generation Programme (PMEGP) has created a platform for MSE’s to develop, with more than 50% of its constituents consisting of women. Additionally, financial resources are becoming increasingly easier to access with government schemes such as the Credit Guarantee Scheme supporting the growth of small businesses. The Micro Units Development Refinance Agency (MURDA) facilitates the distribution of collateral-free loans up to one million, with a specific preference given to women. 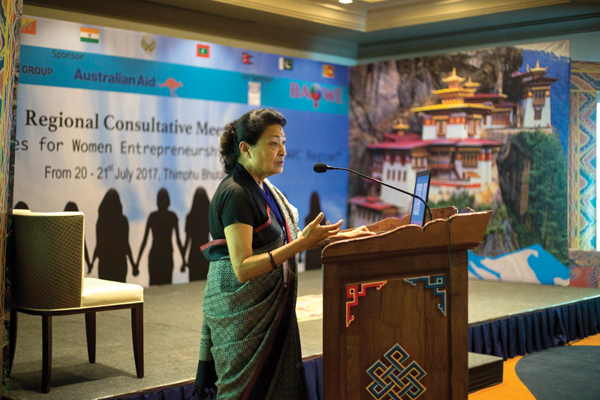 At the SAARC conference held in Bhutan, Devi highlights the importance of enhancing women empowerment. For a country that supports the development of GNH, the increased support of women entrepreneurs is necessary to the overall growth of the nation. Dr. Bina Pradhan is a pioneering leader of women empowerment in Nepal. By focusing specifically on advancing the status and rights of women in society through entrepreneurship and business development, Pradhan has created countless opportunities for Nepalese women. 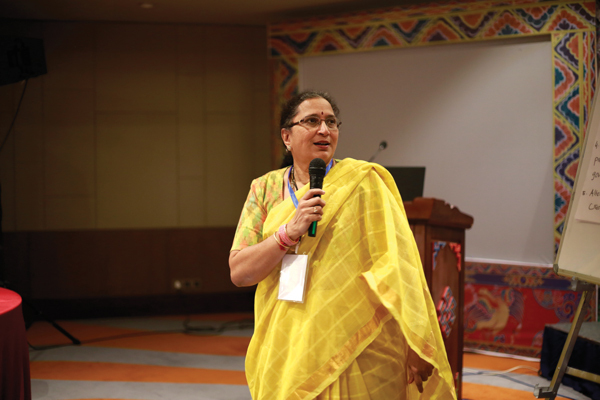 Pradhan first established herself in the 1980s when she founded a center for women’s development in Nepal. She then went on to pursue a PhD in rural sociology at Cornell University after being initiated as a Humphrey Fellowship. Through her research, Pradhan developed her thesis based on her experiences on the status of women in Nepal, particularly on the state of their reproductive health rights. Pradhan believes that the root of this disparity lies in the legal and economic barriers women face. Since women are set at an inherent disadvantage when it comes to obtaining equal property rights, they are forced to work in a limited scope of jobs, with the majority employed in cleaning, farming, or small crafts. The center, Pradhan explains, bridges this gap through exposing women to a more diversified range of careers, such as tea and coffee trading, through training that focuses on product development, branding, and advertising. Additionally, Pradhan is invested in developing cooperatives of women who are engaged in microbusiness, with a cooperative of 700 women in Nuwakot currently receiving Pradhan’s guidance and support. She mentions how, in the future, she hopes to expand the scope of this cooperative’s enterprises to include the development of a chilling plant to freeze foods, as well as a seed bank that will store the area’s stock of seeds. Issues such as equal wages, opportunities, access to financial and human resources, as well as opportunity for adequate training and technical skills, are vital to address. In a country where women entrepreneurs own only 12% of total SMEs, and, as concluded through various studies, they exhibit more enterprising and innovative traits, these women are crucial to shape Nepal’s future. Despite recent advancements since 2011, women in Nepal still face extremely difficult access to financial aid as well as a lack of an official database about various business policies and schemes. 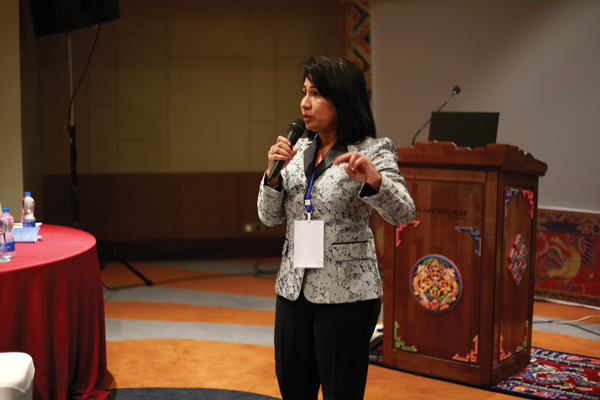 At this critical point of development within Nepal’s society, Dr. Bina Pradhan is acting as a trailblazer in the sphere of the advancement of women through entrepreneurship. Dr. Mariyam Shakeela has established herself as a one of the most renowned leaders of women entrepreneurs in South Asia. Her repertoire extends for more than 30 years, in which Shakeela worked both within Maldives and abroad, engaging in both the public and private sector, in order to gain the invaluable experience she draws upon today. She has succeeded in a variety of fields, including teaching, business and entrepreneurship, hospitality, real estate, medical ventures, and has even served in the Maldivian Government as an authoritative Cabinet Minister. During her career as a cabinet minister, she initiated several projects concerning Environment and Energy, Gender Family and Human Rights, National Social Security, Climate change, Water and Sanitation, Foreign Affairs and Health. Additionally, Shakeela brought her expertise to function as the Chairperson of WHO (World Health Organization) Executive Board. Shakeela’s work and accomplishments are certainly extraordinary and exceptional, however, she reveals that the environment for women entrepreneurs in Maldives is not as open and opportunistic as she hopes. Although SME policies foster the development of small businesses, mainly through the allocation of financial support and the implementation of goods polices, Shakeela points out that the implications of Islamic Law acts as a barrier to women. Women entrepreneurs, consequently, are kept far-removed from the mainstream market; this can be due to the fact that the business realm is traditionally seen as male-dominated. Despite government efforts, entrenched beliefs and values hinder women entrepreneurs from reaching their full potential. Ultimately, Shakeela believes that the way forward for women is to overcome these barriers, and in order to accomplish this, they must foster a sense of confidence and empowerment. With time, she believes that these archaic notions can be broken.